Birds must be making shelter from the approaching storm front. Things went quiet all of a sudden. Just Friday, the river was buzzing with calls from Common Yellowthroats and today there were none. We did manage to capture two, though. Hardly anything was on the wing today. 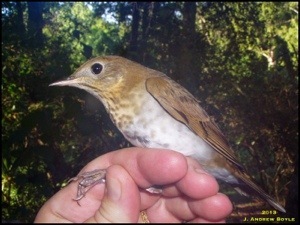 I guess the Bird of the Day will have to go to our Ovenbird that we originally banded in the Winter back on January 6th of this year. Little fella made it home and now back again. 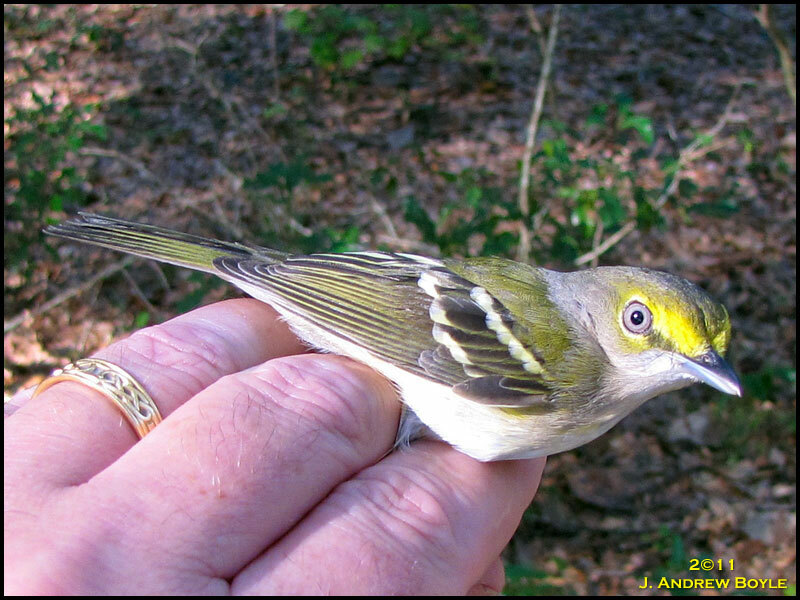 Runner up was a beautiful adult Red-eyed Vireo. Next week should bring up more numbers as the peak will be nearly upon us. Finally no rain the night before. Some migrants are around but mainly Common Yellowthroats. A few Northern Waterthrushes remain and we captured 3 today. Our first bird of the morning was a juvenile Brown Thrasher. We knew they were lurking in the woods. Plenty of volunteers around. Now we just need the birds to get down here. Sometimes you just have to add some extra banding time in. Such was the case this weekend. Birds were showing up on the NEXRAD radar sites Friday night so the troops were rallied and a few of us made it out Saturday morning. The radars weren’t lying. The next migration species were arriving just about right on time. Common Yellowthroats return in early September. One was seen last Sunday out in the marsh and several were seen Thursday and Friday at nearby Mead Garden. They were the most captured species this weekend. 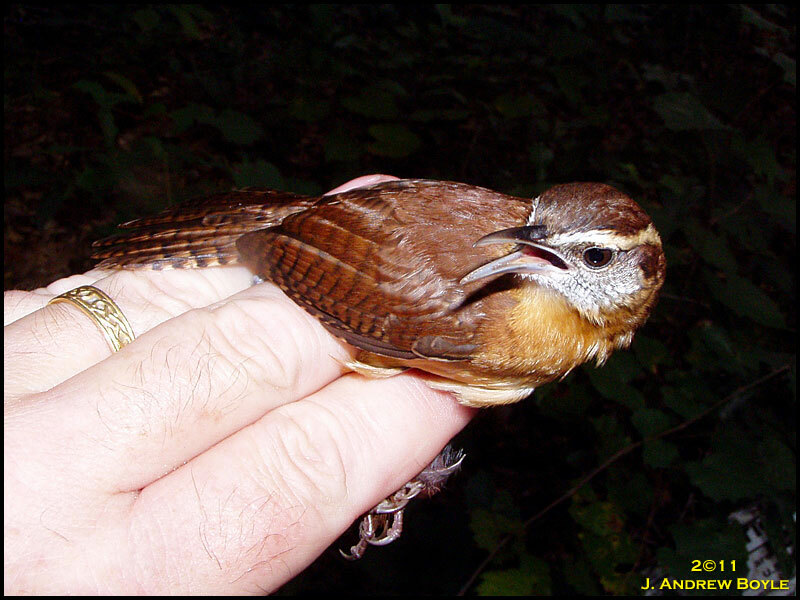 A Carolina Wren hit the nets early. It seemed to be having a bit of a frown but it was a recapture so it knows the routine. 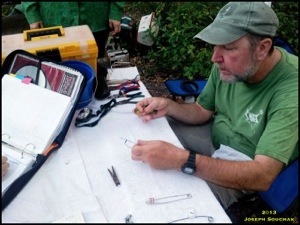 Near the end of the morning Richard delivered a Red-Eyed Vireo to the banding table. This bird had a brood patch meaning nesting in the area. Confirmation from our friend Paul Hueber showed that this species is indeed breeding in the park this year. As we were wrapping up the nets for the morning we had a recaptured Yellowthroat and then a major commotion down at Net 18. 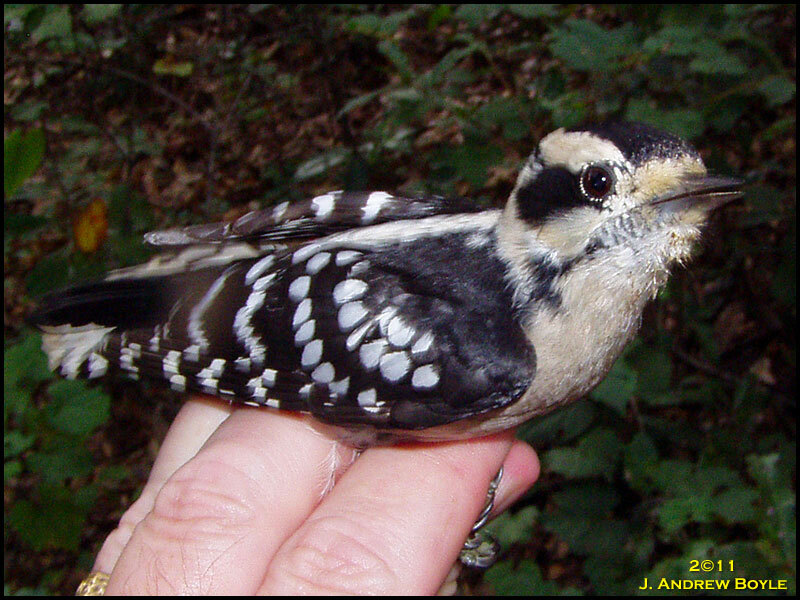 Richard discovered a pair of Red-bellied Woodpeckers in the net and they were a handful. 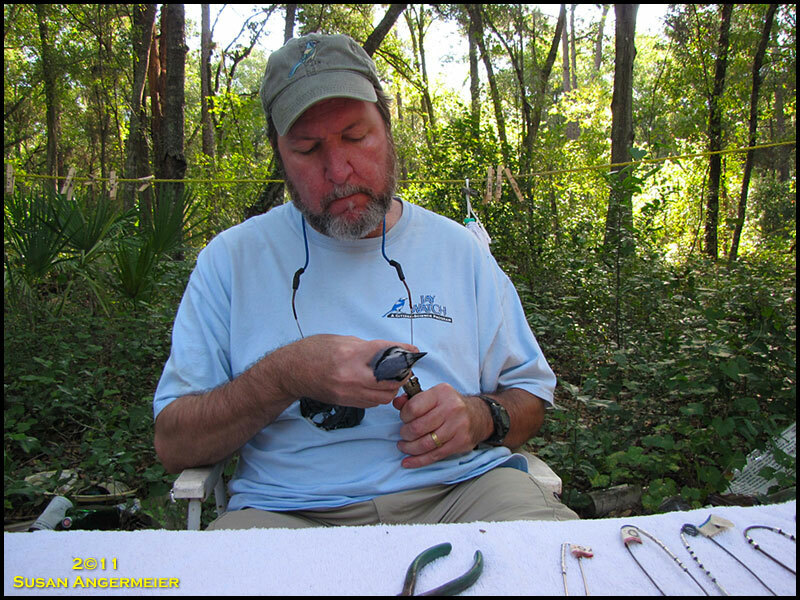 The first one banded was a female. The loudest of the pair turned out to be a juvenile, apparently from the first brood of the year. We know that there have been at least two broods this year with one just now leaving the nest cavity nearby. Back to the grind on our usual Sunday. Again, Common Yellowthroats were the most captured bird species. 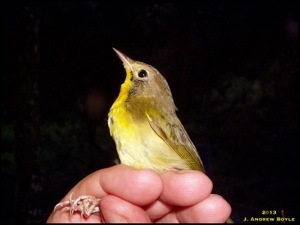 This first wave of Yellowthroats in migration is full of females and juvenile males like this bird. 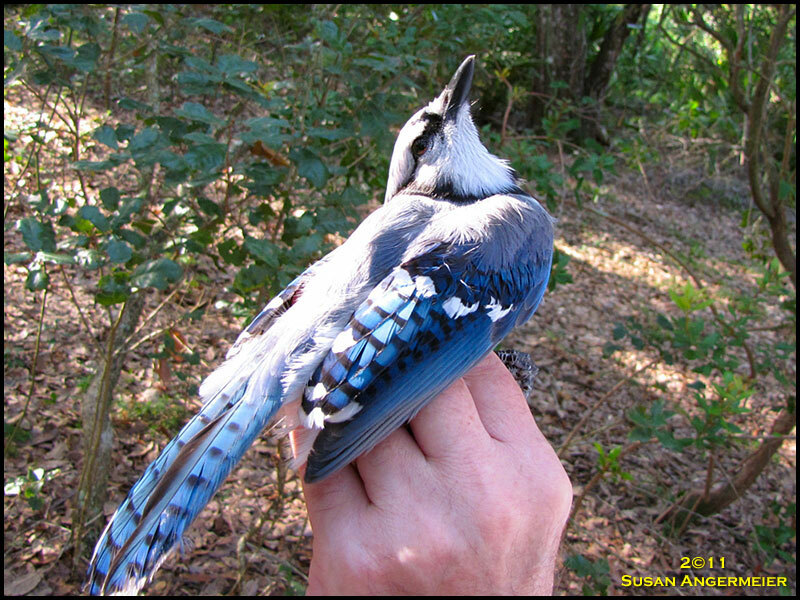 One would think that we have captured and banded all of the local Northern Cardinals but we still keep getting them. This bird did not want to let go of the holding bag. More proof. 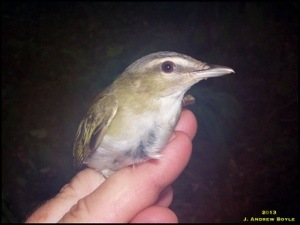 Even after it was measured and banded it sat on the table, grasping onto the bag and soon flew off back into the scrub. 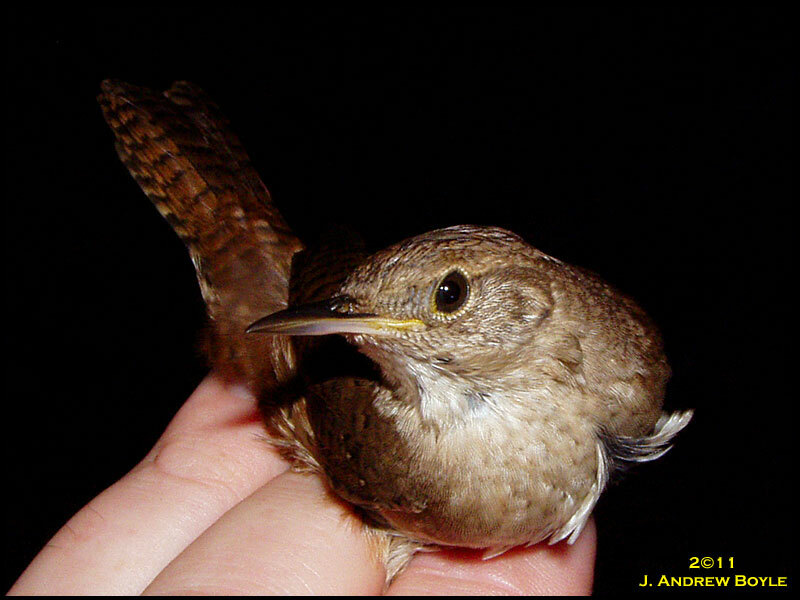 Northern Waterthrushes are still around and we caught one at the mid-point of the day. Becki, Joe, and Linda process another set of Common Yellowthroats as the morning moves along. Turning out to be a good weekend for woodpeckers. Charles brought in a recaptured Downy Woodpecker and Becki got all the details before releasing it. Then the call came that an interesting thrush was caught. Turns out that it was a Veery. They typically arrive a week later but we will take it! Christine was having a good day down at Net 14. She soon returned with a pair of male Northern Parula. This species has been all over the place this year and seem to be hanging around a little longer than usual. At least as far as our usual capture dates in the past. We often capture birds as they chase one another and that probably was the case for these territorial male Northern Parula as they were both in the same area of the same net. A really beautiful bird when you study them close up. We are still hoping for drier conditions. Weather patterns keep soaking our feet and nets but fronts are beginning to shift. We can’t complain with the variety we got this weekend, though. Would have loved another Saturday opportunity but I had to lead a Birding Walk. Itching to get out. Sunday did provide us with a good variety of birds and the Indigo Buntings made a good showing. We processed 28 birds today! Could have bumped up the total by staying longer, but…. Oddly, we seem to be running low on Catbirds and we have not seen a thrush at all for weeks. A check of the site on late Monday revealed that the river was up 4-5 feet and the several nets at the end of our lanes were a foot deep in water! 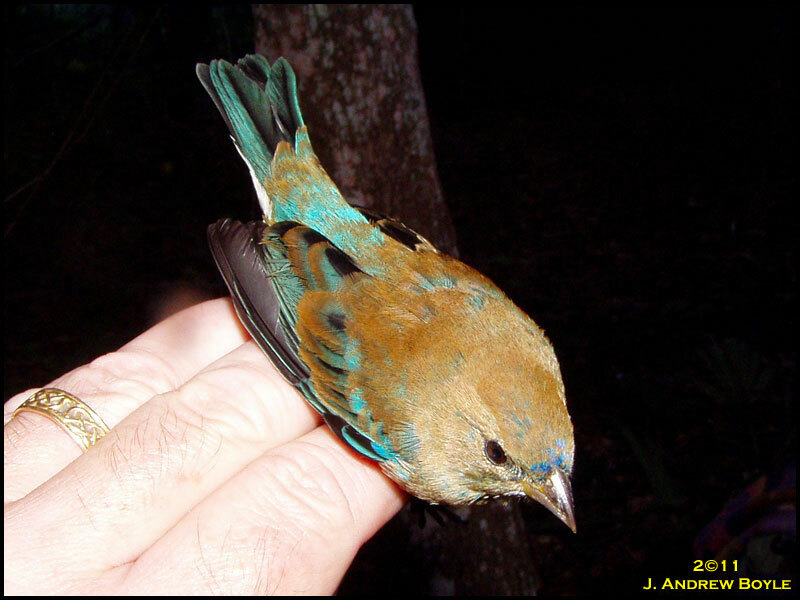 However, many Indigo Buntings are there and 2 male Painted Buntings were spotted. Following a great start to the migration push we find ourselves wondering what the heck happened. Just one day later and the birds have seemed to have disappeared. Only 9 birds today. NEXRAD radar indicated the first strong migration push of the season. Right on schedule! So, we planned a special Saturday so we could capture as many birds as possible. Glad we did. We ended up processing 24 birds including the First of the Season Gray Catbirds and House Wren, also right on schedule!